Landing fee reduced to only £5 at weekends during the season. The Airfield operating hours are from 0800 to 2100 local. The Western end of the parallel taxiway for RWY 25/07 is out of use due to work in progress. Do not proceed westbound along the taxiway beyond the 07 Hold Board. To visit Eaglescott, PRIOR PERMISSION is REQUIRED (PPR) by telephone between 08.00 and 09.00 or by email on Friday evenings. if no contact is made, then the airfield is closed and you may not land. 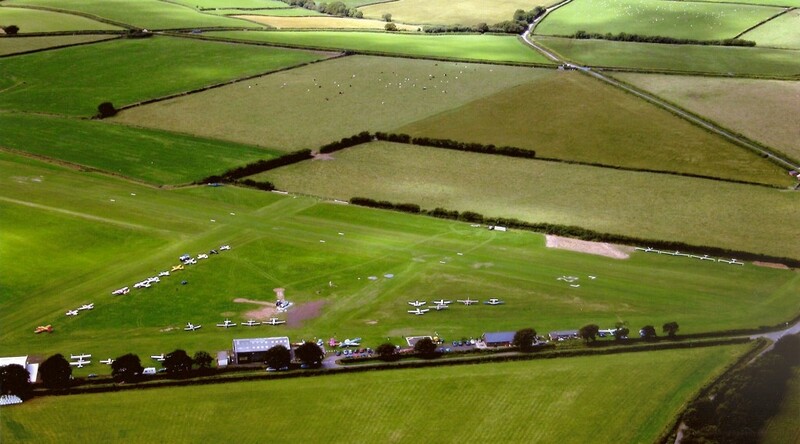 Weekday Landing fee £10 for Gyro’s, Light Helicopters, Microlights and all Light Singles. 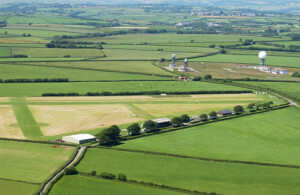 The Devon Air Ambulance is based at Eaglescott, callsign Helimed. The Air Ambulance always has priority when departing the airfield, as it will be on an emergency call. On hearing the Air Ambulance, if you are on base or final, continue to land. If in the overhead or downwind, please orbit until the Air Ambulance has departed. Please call (123.0 MHz) 10 miles out. Most of the time, the radio is unmanned so make blind calls. Make a standard overhead join at 2000′ QFE, left hand circuits. 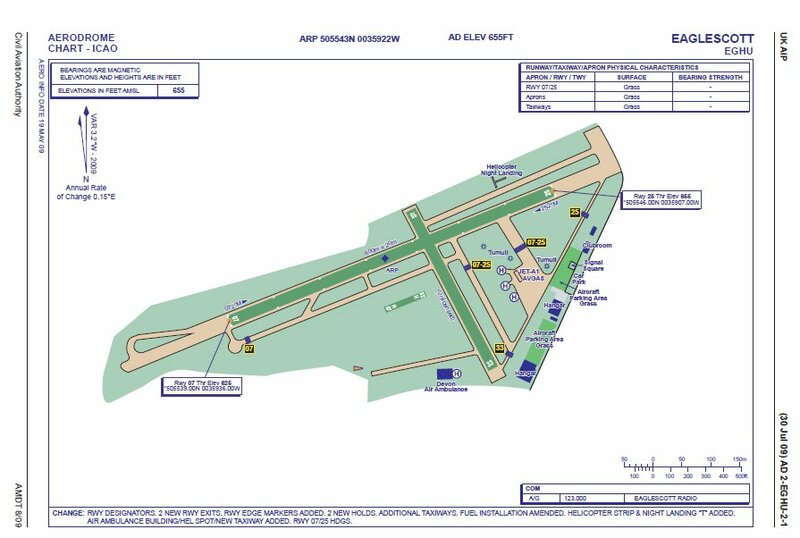 Airfield elevation is 655′ AMSL. Please note payment is by cheque or cash. The airfield has no credit or debit card facilities. A Google Earth satellite picture of the airfield is available here. The radar station and ‘golf ball’ can be seen in the picture below.